Taken on Jun. 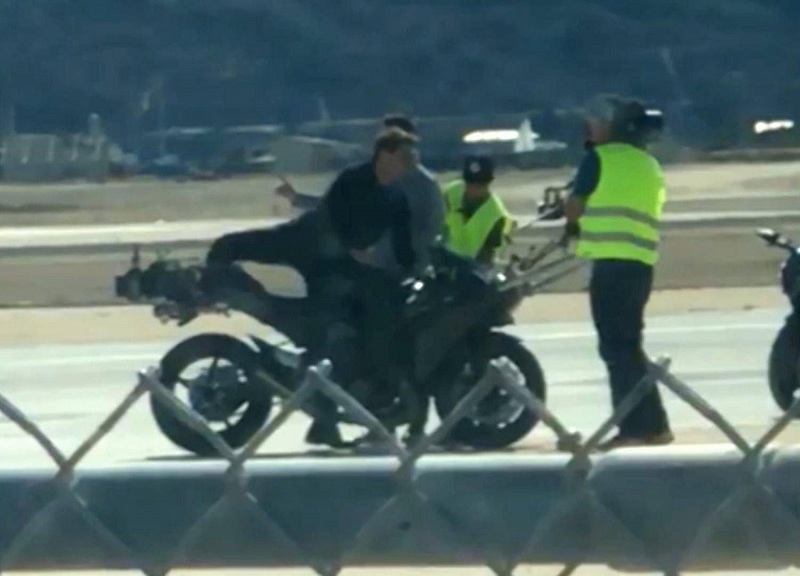 1, 2018 the video in this post shows Tom Cruise riding a motorcycle around airfield as Maverick in first pictures from Top Gun: Maverick set. According to Daily Mail, the bike wasn’t the only vehicle present Maverick is used to handling; also parked at the San Diego military base was one of the F/A-18 Super Hornet fighter jets that will likely feature in the movie. Noteworthy as already reported Maverick’s ride for Top Gun sequel will be a cool special painted F/A-18F Super Hornet (which recently experienced a mid-air issue while it was flying with Tom Cruise on board). The movie starring Tom Cruise and Val Kilmer is looking to cast the son of Maverick’s Radar Intercept Officer (RIO), Goose (played by Anthony Edwards in the original). Top Gun: Maverick will also see Kenny Loggins re-recording ‘Danger Zone’ for the movie.